Light grey is a color although at first thought may seem mundane but is far from it. 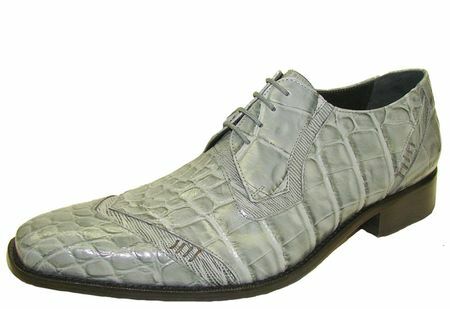 These light grey crocodile print leather crocodile print leather dress shoes by Giorgio Brutini Shoes have the style to really bring the noise. Featuring an Italian lace up pointy toe style with red painted soles also made of leather for extra effect. You'll love how fast the compliments come rolling in every time you wear Giorgio Brutini on your feet. Zoot Suits are how you party 1940s style.